New and refurbished brake armatures are available at Duke Brakes, You can rest assure our technicians will be qualified to answer your questions and help you find the right product for your application. 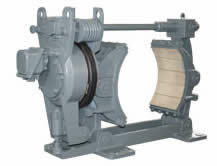 Our experience with crane and mill duty brakes has made our company a leader in aftermarket brake repairs and rebuilds. Contact us for more information on our replacement parts and services.